Not since the release of A Framework for K-12 Science Education has a document held such promise and significance for the science education community as does the Next Generation Science Standards. The NGSS aims to better prepare U.S. students for the rigor of career and college-level scientific study by stressing the importance and integration of the three dimensions: science and engineering practices, disciplinary core ideas, and crosscutting concepts. They will provide for a more integrated and cohesive approach to science instruction, leading to a more scientifically literate citizenry. However, the NGSS also marks a change in how we think about science instruction and the task at hand, the adoption of these new standards and their incorporation into instruction, will require a significant amount of support. The key to unlocking the full potential of the NGSS is a deep understanding of the interrelationship of its core ideas, scientific and engineering practices, and crosscutting concepts. This brief and easy-to-use Reader’s Guide offers teachers, principals, district and state administrators—anyone with a vested interest in improving the quality of science education—the tools they need to fully absorb the new standards and begin to implement them, effectively, into classroom practices. What I really liked about the book is that it is a practical guide which introduces the standards not as a stand–alone entity, but as a basis for you and your team to design, implement, and assess curriculum. Since the approach is one of research and collaboration, so much of this first guidebook lists resources and references. It takes on the purple, orange, and green NGSS boxes and demystifies them. It is pretty cool, and I learned so much that I can’t wait to share with my fellow science teachers! Though I was quite excited about the NGSS because of the cross–curricular implementations, now I understand why. The standards are the vision and not a cookie cutter list of things that must be taught. I strongly feel that this approach will allow us as teachers to develop lessons which encourage our students to engineer rather than to memorize their way through science class. This how–to–do–it–without–freaking–out book is an extraordinary resource which is essential to tracing the steps to where you, your district, and your students are in their science education program and where you want to go, using the three dimensions of NGSS and webbing them through the K–12 science program. Buy the NGSS and The NSTA Reader's Guide and Save! 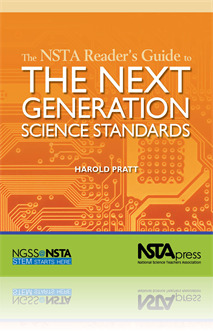 This set includes The Next Generation Science Standards: By States, For States Volume 1 + Volume 2 and The NSTA Reader's Guide to the Next Generation Science Standards.